CELLULAR. Image courtesy the artist. CELLULAR is an interactive and dynamic projection full of glowing orbs. You can control one of them from a browser, be it right in front of the piece from your phone or from your phone and laptop at home. Tap your phone and swing it around to make your orb fly around. When your phone is tapped, your orb glows bright, and its dynamics are controlled by the movement of your phone as you shake it around. At the same time, you can see the glowing orbs of other participants. When orbs connect, they briefly form a larger one. You can form orbs of different sizes together, or zip through rapidly, forming and destroying them. 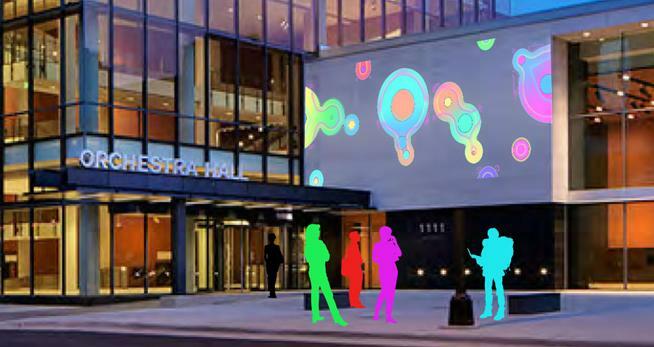 This projection piece seeks to create a medium connecting people at home and at the piece itself, from inside the event and outside. It is a membrane to highlight the collaboration and interactivity of Northern Spark. Participants can explore it alone and together, to understand what systems of play can arise through CELLULAR‘s individual and collective interactions.